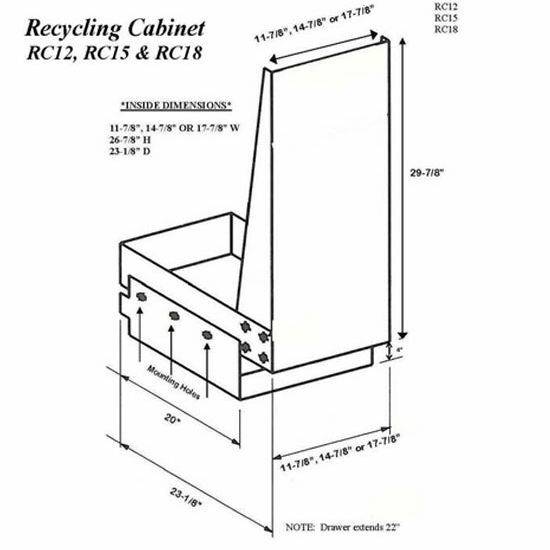 Easily separate recyclable items with this versatile Recycling Cabinet by Imperial, perfect for any homeowner who is environmentally aware.This unit is a convenient way to replace a trash compactor by filling in the space and can be used for recyclable items or for trash. 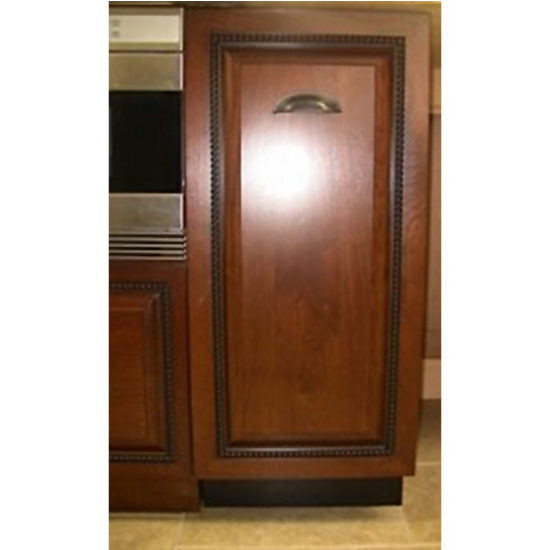 Available in 12", 15" or 18" sizes, with your choice of stainless steel, wood front ready, black or white matching front panels, this cabinet is constructed to allow for a matching cabinet door. We are thrilled with this product. We were unable to find a replacement trash compactor when the one that was in our home when we bought it broke. We did not care about having a trash compactor at all but the empty cabinet space was ugly. This fit perfectly, looks great and was a breeze to install. We love it. I received this product two weeks ago. First off, I received the product within two days of ordering it. I am in CA and it came from the LA area. The product was well boxed and did not have any destruction from shipping. The product is solid and the SS is of good quality. I installed the product in an area that previously had a 12" trash compactor in it. The fit was perfect and the installation was not difficult. I highly recommend this product to fill an area vacated by a trash compactor. I would purchase this product again. This product did exactly the job I wanted it for. We installed this to replace our 15 inch trash compactor. Easy installation and looks great. The only thing I did differently is that I did not use the two small trash cans it came with. I had a plastic Sterilite Lift Top laundry basket size 2.3 BU/81 L that I was so longer using as a laundry basket. I tossed the lid and I use it with a garbage bag insert as my receptacle. It fits perfectly and works great. I am very pleased. I searched for over an hour for a replacement cabinet for a garbage compactor. I accidentally found what I needed advertised as a recycling unit. I hope you find a way to tell people about this fabulous garbage compactor replacement. This was the only reasonable replacement for our old stinky trash compactor. Metal front meshes well with our decor since wood would not match existing cabinets. The unit was easy to install and the sliding action is smooth. The handle could have been larger and more ergonomic and the price for the unit is a little steep but since this is the only replacement I was able to find I consider it a good buy. Arrived better packaged that any item I have ever ordered. Installation needs a seasoned do it yourselfer and was straightforward but took some patience—especially if your floors are not level. Shims and a level should be at hand. Directions for installation are slim and not all that helpful. 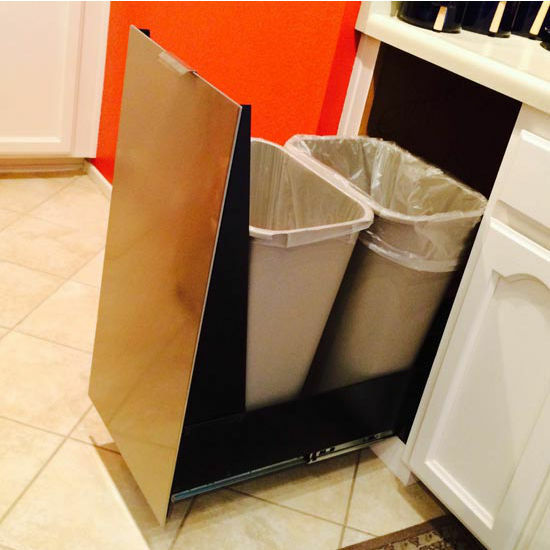 Great solution for replacing an old trash compactor. Easy assembly. Good quality. Perfect replacement for an outdated trash compactor. Goes great with our stainless appliances and we just love using it. A perfect option to replace an outdated 27 year old trash compactor. Fits in the same space perfectly, and the quality is well worth the money. The installation may require some wood spacers on each side to center the unit but it's no big deal. The trash/recycle cans are the perfect size and compatable with target or other bags. When I purchased an old condo that needed work, the garbage compactor was such an eye sore. I didn't want to replace it, and I had no idea how I would fill that space in my tiny galley kitchen. I was so happy to find that there were actually other people with the same issue, and that there was a product to solve my issue. It looks great and definitely serves the purpose. I had a little bit of a hard time installing it, but overall a terrific product. We replaced an old, ugly trash compacter with this pull out and its perfect. Highly recommended. It matches well to stainless appliances. Install was fairly simple, but had to spend some time getting it level. Incredibly happy with this. This was the perfect solution to replace an outdated trash compactor. And it looks great! It was not that difficult to install either. It's a very good product. I bought the 18" to fill the void of my horrible and dirty trash compactor after several months of trying to find a less expensive solution. All the solutions I came up with were more work than savings. Product: looks great, matches oven, cooktop and dishwasher. (I bought the Stainless Steel). My wife and I installed it in two hours or less taking our time. Drawer glides in and out with a finger pull - easily. If I was going to change anything, I would ask the company to upgrade the drawer glides to be more heavy duty even if it cost more money, (however the current glides are of good quality), I just know my kids. this is great product, great unit, I wish I had found it several months ago. This is a great product, the only thing they could do differently is change the handle. Otherwise i cannot believe what a wonderful product it is. It slides so wonderfully and is quiet. Was very excited to receive the cabinet but slightly disappointed when the rails did not slide out all the way. Customer service was great and sent out a new pair in two days. Now...it looks great and works perfect. Would recommend slightly better instructions though. Perfect fit and finish, smooth and quick delivery, excellent product. We got the stainless version and it looks very high end in our kitchen (matching the dishwasher, fridge etc). Would highly recommend to anyone looking to sub out their old garbage compactor. Even though I did not do a full kitchen redo, this replacement for a compactor that I never used makes for a real updated feel. The removal of the kitchen garbage can that sat out in the floor at the end of an island, gave more room in the area near the oven, as well as giving a much cleaner, neater, look. This is such a creative idea to fill a niche created by aging compactors! Keep up the good work. Fits well, solid build, good customer service, fast shipping. I was happy to find a trash and recycling pull out to fit in the space from our 18 inch trash compactor. It was easy to install and it rolls in and out very easily. My only complaint is the top where the edges of the sides. The top edge has a space becasue we didn't want to cut into the cabinet. The item arrived with the incorrect color of front panel. but the service provided by Katie Akerson, customer service was excellent and the correct panel was shipped at no expense to me. The item was exactly as advertised. I am very satisfies. It didn't get the 5th star the product deserved because the instructions for installation needs some work. There should be a step by step instruction with associated pictures. With I product so well made I was miffed by the sheet the accompanied it. OH by the way it was packed for shipment great. Perfect replacement for the old trash compactor. Well made, and looks great next to all the stainless steel appliances in our kitchen. We were concerned that the trash can was going to be too small, but it is actually just as large as the trash compactor, and know we have a extra can for recyclables. For years we've been struggling with the old trash compactor that came with our home, but put off changing it out for fear that matching the cabinetry and size would be impossible. Then I found this unit which is perfectly sized and designed to replace our 18" trash compactor. We ordered the stainless to match our appliances and it is beautiful, easy to install, opens effortlessly, and is exactly what we were looking for. I couldn't be happier! Easy to install, the top and the bottom of the face not vertical, did not match up with the cabinet. 1/4" difference, I got over it. Excellent product. Horrible shipping. Had to get it replaced because it was damaged in transit. Got it installed and it's great! 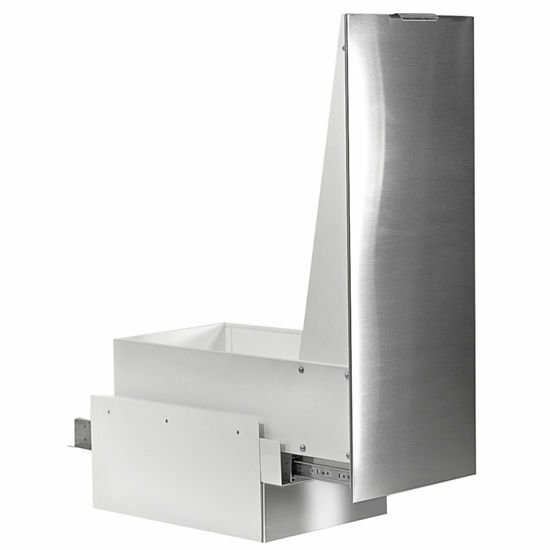 Stainless Steel Recycling Cabinet- Perfect!! This product fit the space used by our old trash compactor perfectly and was easy to install. It looks wonderful too! Great Solution. Good sturdy product. Easy solution to replace our broken 18 inch Kitchen Aid trash compactor. Fast delivery and easy homeowner installation. 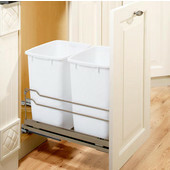 This trash/recycling pull out shelf is a perfect solution to fill in the 15" space where a trash compactor used to be. 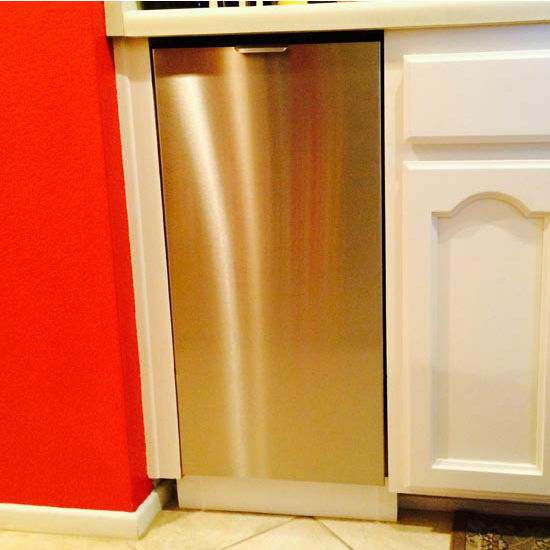 We purchased this unit (18-inch SS version) to replace an old KitchenAid Trash Compactor. While the unit's build quality was so so (Bent internal sheet metal with blemished paint surface, not completely flat fornt-lower kick panel), the unit is very nice. We are very pleased with its look and operation compared to our old trash compactor. The installation is easy as long as the cabinet opening is slightly larger than 18 inches in width so the door (when closed) fits in nicely into the cabinet. Our cabinet required a bit of trimming and stain touch up. We also purchased 2 41-quart trash bins (one for trash and the other for recycling) that fit nicely inside the unit. Would recommend this unit. Overall this is a good well made product. As noted in other reviews finding 41 quart barrel that is smaller than 15 inches wide is hard to do. I ended up trimming the ends of a standard 41 qrt barrel which seems to work. Improvements would be to have screw in feet to allow for proper leveling and including the barrels or selling them on this site. I got the 15" stainless front panel recycle drawer with black interior. I found the stainless steel to be of good quality and was also happy that it had a stainless kick plate. However, I did find it hard to find a pair of waste baskets to fit and ended up having to trim off the top rims of the 10 gallons I found in order for them not to tip when I opened the drawer. For the price I feel the waste baskets should be included (otherwise it is a 5 star item). Other than that I find it to be a great looking and functional part of my kitchen. Had a small problem with one the drawer slides on my cabinet.I called and received a new slide in two days. Excellent service. I would order again! It perfectly fits the space where my 18" Kitchen Aid compactor was, and the quality is excellent. FYI We purchased this to install between cabinet and dishwasher. The instructions are to screw the base unit into cabinets on both sides. WE did just the one side and seems to be working OK. Don't know if it will skew over time becasue one side only. Great product. Easy to install. We are having trouble finding right size trash cans. Took some time to find this product. 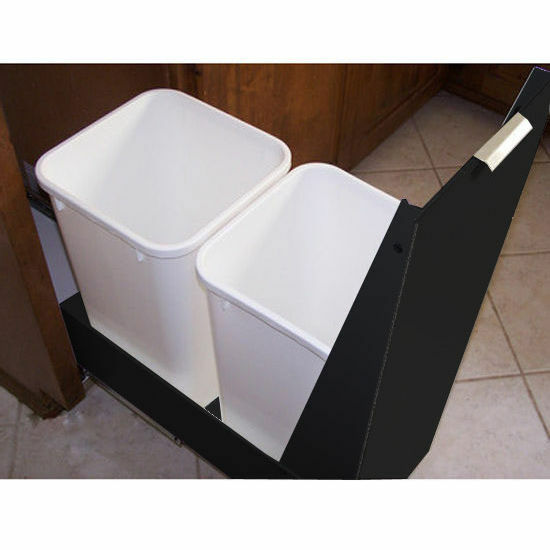 Great product as a replacement for a trash compactor, solid construction. I got RC-15SS and it looks good. Buy RV-50-8 50qt container and fits 2 in the 15" version. We were looking to replace our Kitchenaid Trash Compactor and this is a great replacement. Easy to install and looks great in my kitchen. We got the Black on Black. The young lady I placed the order with was very helpful and informative. I will definitely order from them again. The trash/recycling center does include a 10gal trashcan. In the past, customers had a very difficult time locating bins to fit into the centers, so Imperial started including them for the customer's convenience. 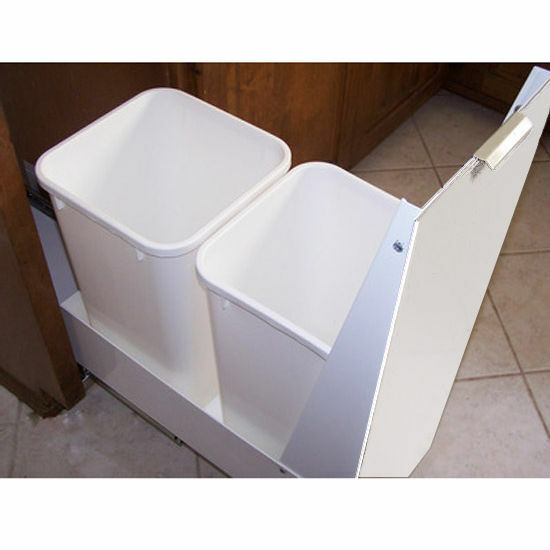 If you are able to find another bin that would fit and work with your cabinets dimensions, you would of course be able to use the bin. The 12" cabinet includes 40 Qt. (10 Gal.) 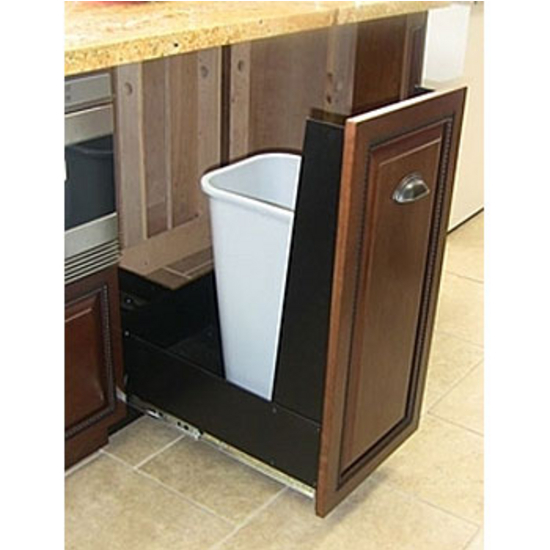 trash can & hooks on inside front panel to hang trash bags; 15" cabinet includes 2 x 30 Qt. (7.5 Gal.) trash cans; 18" cabinet includes 2 x 40 Qt. (10 Gal.) trash cans. 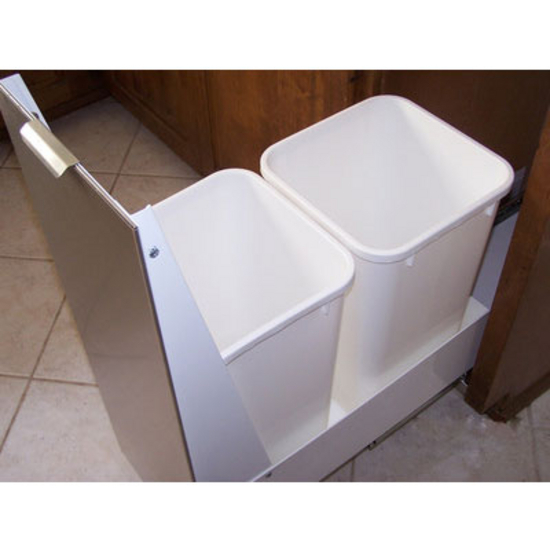 This item ships with 2 Size Trash Can: Fits 2 x 30 Quarts (2 x 7.5 Gallons). If you choose to use different cans, please review the specifications of the item at https://www.kitchensource.com/trash/pdf/im-rc_information.pdf along with the dimensions of the space you have to determine a fit of a different can. This item takes the place of a trash compactor. It is meant to sit on the floor and mount to cabinets on each side to hold it securely in place. The overall dimension of the item with a panel is 12" W x 23-7/8" D x 34" H. You can also review the specifications at https://www.kitchensource.com/trash/pdf/im-rc_information.pdf for a detailed drawing to see if you will need to fill any gaps. The wooden panel is actually not included. It is just built with a wood front ready panel. So yes, you would be able to use your own panel. The 12" unit only has enough room for a single 10 gallon trash bin. 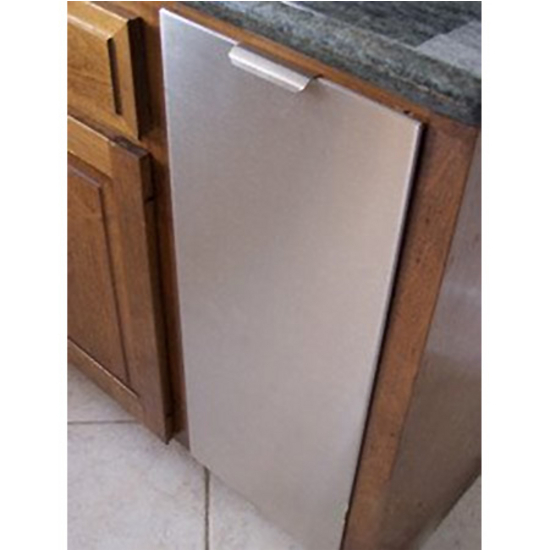 The Stainless steel is a sturdy 18 gauge 304 brushed stainless. Many reviewers have mentioned how nice it looks and how high quality it is. Unfortunately this item is not available with the soft close feature. The stainless version just comes with a stainless steel door front, however the base and the rest of the unit would be white or black. A stainless body is not available. Item IM-RC15BL-WF comes as a wood front ready panel, so you would need to supply your own panel. By purchasing your own panel, you would then have the option to paint or stain the wood. You do have enough depth. With the panel, it's overall depth is 23-7/8". Without the panel and just wood front ready, it's 22-7/8" D.
When ordering this item, the base and back portion of the unit would be color chosen; White or black. The front panel would be stainless steel if a stainless front panel is chosen, but the rest of it would be black including the kick plate. Yes, as long as you purchase the wood front ready panel option, it will have holes drilled on the front panel to accommodate your own custom wood door or panel. You can install a different handle if you wish, you would just have to drill all the way through the panel and you really wouldn't want the screws to be that long. This item is not available with a foot petal. If you select Black, the front panel will be black and it would not be wood front ready so you would not have to attach a wood panel. The item is 23"D overall. You can set the item forward in your space so that it is flush or put it where it works best for you. 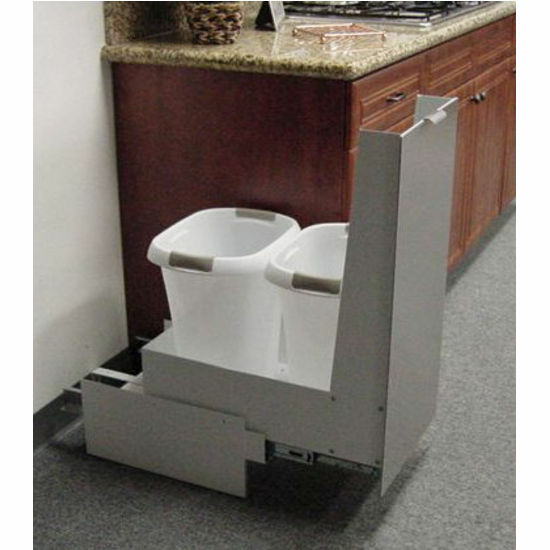 The unit weighs 42lbs and features full extension glides for easy access to the bins. Yes, this is a standalone unit that has its own base, it is designed to fit in open space between cabinetry. Any 40QT trash can will work. The 12" cabinet includes a 40 Qt. (10 Gal.) Trash Can.